Whitewater Wisconsin Dentist | Dental Perfections | Q: What Is GERD? 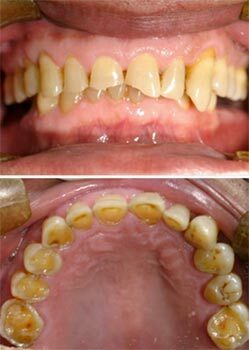 Severe tooth erosion caused by endogenous acid in a patient with GERD. Copyright 2012 Sarbin Ranjitkar et al. Acid reflux, commonly called GERD or gastro-esophageal reflux disorder, is a concern to dentistry because it destroys or dissolves the tooth structure away. Fully 40% of Americans have GERD, and of that number 40% of them don’t even know that they have it. Stomach acid has a pH of 1.5 – 3.5 which is highly acidic. This strong acid creates a very characteristic pattern of tooth wear easily identified by a dentist. Interestingly, dentists are often the first person to diagnose GERD. Will It Harm My Teeth? If GERD is left untreated, it can cause extreme tooth wear leading to extensive dental needs. More importantly, the esophagus does not like the chronic exposure of this strong acid and causes Barret’s esophagus or esophageal cancer. Can I Prevent GERD by Changing My Diet? Can I Do Anything Else to Prevent GERD? While monitoring or changing your diet is an important start, you can also try chewing gum, making sure not to overeat and not eating too fast.